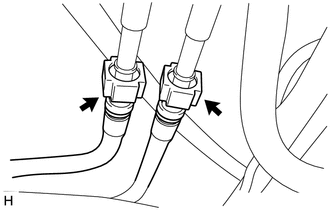 After turning the ignition switch off, waiting time may be required before disconnecting the cable from the battery terminal. 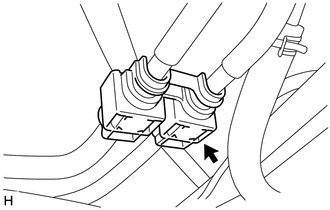 Therefore, make sure to read the disconnecting the cable from the battery terminal notice before proceeding with work. (a) Remove the 4 nuts and No. 1 fuel tank protector sub-assembly. 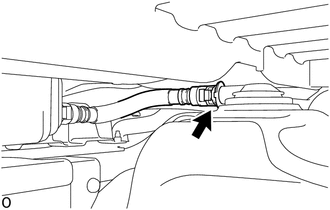 (a) Remove the fuel pipe clamp. (b) Disconnect the fuel tank main tube sub-assembly. 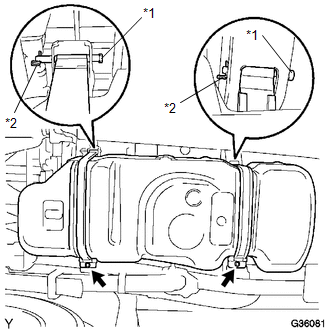 (a) Pry up the retainer of quick connector and disconnect the fuel tank inlet pipe sub-assembly from the fuel tank assembly. Check for dirt or other foreign matter on the parts to be disconnected and clean them if necessary. The quick connector seals with an O-ring. Ensure that there is no damage or foreign matter on the contact surface. Do not use any tools. Do not bend or twist the tubes. Protect the contact surface by covering it with a plastic bag. If the connector is stuck, push and pull on the parts to separate them. 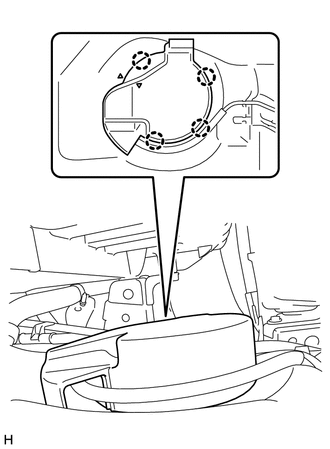 (a) Disconnect the fuel tank vent hose sub-assembly. (a) Disconnect the fuel breather tube. 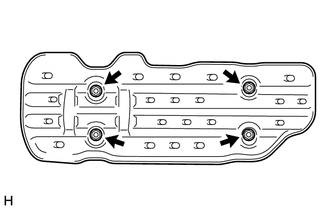 (1) Disengage the 4 claws and remove the fuel tank cover. 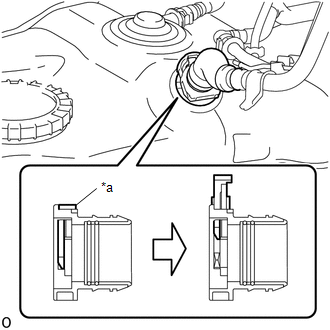 (c) Disconnect the 2 fuel suction tube with pump and gauge assembly connectors. 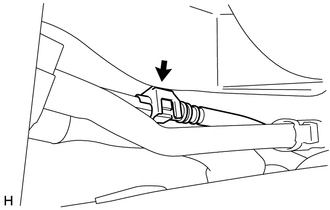 (d) Hold the fuel tank using the engine lifter. 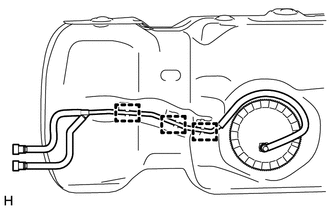 (e) Remove the 2 fuel tank bands. (1) Remove the 2 bolts. (2) Remove the 2 clips, 2 pins and 2 fuel tank bands. (f) Slowly lower the engine lifter slightly. (a) Remove the tube joint clip and pull out the fuel tank main tube sub-assembly. Remove any dirt and foreign matter on the fuel tube joint before performing this work. 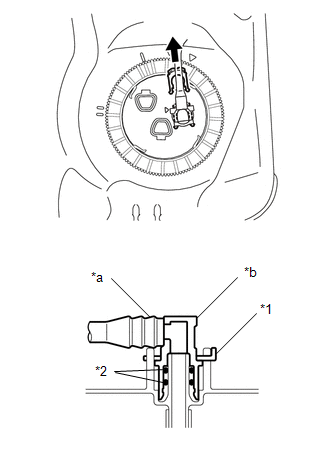 Do not allow any scratches or foreign matter on the parts when disconnecting them, as the fuel tube joint contains the O-rings that seal the plug. Protect the disconnected part by covering it with a plastic bag and tape after disconnecting the fuel tubes. 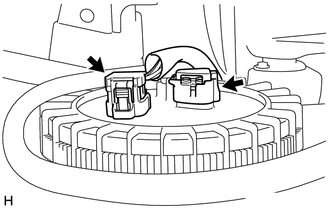 (b) Disengage the 3 clamps and remove the fuel tank main tube sub-assembly from the fuel tank sub-assembly. (a) Remove the 4 clips and No. 1 fuel tank protector.